In regards to feeling good, I’m one of those people who will continue to experiment until I feel the best I could possibly feel. Or till I die, whichever comes first. I didn’t realize that I felt crappy for the first 24 (or so years of my life) until I started to feel better. I had headaches, skin issues, anxiety, brain fog…blah blah….all this stuff I could medicate, push down, and cover up. And I did for a long time—because I was athletic and intelligent (at least in school) and at a “healthy” weight by height/weight chart standards. My first experience with experimenting with health was when I was 23, living in Boston alone for the first time, and I asked my doctor if cutting sugar out of my diet may help some of the health problems I was having (I had already consulted Dr. Google). I tried it. Without her help, with a few tears (stevia was so gross and licorice-y tasting back then), and without any support (except long distance from my Mom and Sister). I also will admit that I went in streaks with this at first—maybe I drank too much alcohol sometimes, maybe I had a few mocha thing-a-majigs from Dunkin Donuts on base (my civilian boss sent the airmen on dunkin runs each morning—great use of appropriated funds, I agree. I wouldn’t support that nowadays–I’m older and wiser and more responsible, and I am not scared to stick my neck out anymore. But that’s a different story). I don’t intend to go over my health history and exploration here again, but I have been contemplating the process recently. Clients at all stages of exploration (and readiness) enter my life all the time. One of the most interesting exploratory paths I’ve encountered is the ultimate example of the misuse of Labeling and Diagnosing….. In all seriousness, IBS is not an actual real “Thing,” but rather, it’s a category of conditions related to the digestive system. I’m encouraged that there’s hope for health improvement when a person who has been “diagnosed” with IBS comes to me for help because I know we can then begin down the road to exploration. We’re taught to feel comfort among our labels and diagnoses. They often become a part of our identities. But, IBS is similar to labeling ADHD and autism in children, diagnosis-wise. A child’s ADHD can be caused by many different things, some dietary and some not. The label may give us a starting point for exploration, but it is just that—-an umbrella term and A Starting Point. One of the most common frustrations for my clients is in regards to the IBS diagnosis, because it is presented as if it is one thing. The benefit to the diagnosis is gaining a starting point, and a feeling of hope can be reached by understanding that in most cases (1) we don’t have to start with a knowing of what thing(s) cause the issue and (2) we have a great effective way to explore further. The problem arises when the diagnosis leads to a person discontinuing the exploration. The truth is that your intestines actually serve as a second brain, based on the way they’re “wired” and connected to your physical body, chemistry, and brain. In fact, your intestines are more in control of your mental health than your brain chemistry—if they’re not happy, they will not function well, and this trickles upward to your actual brain chemicals. Garbage in (mentally and physically), garbage out. We just usually start our exploration downstream from the real issues—if your problem is anything from bloating to anxiety, we have to take several steps upstream to leave the arena of symptoms and find the roots of the problem. The interesting part is that your Garbage does not equal my Garbage. So you can’t just copy what someone else does with her diet/lifestyle and expect success. The first phase of exploring a diagnosis of IBS (or of any instance of feeling unexplainably crappy), is to do an elimination diet. When in doubt, Treat the Gut. I recommend getting the help of a doctor (functional medicine focus is best). I’m always sad and frustrated when an “IBS” client comes to me and says the doctor is having them live on white pasta and white bread—because it calms the symptoms of the IBS. Short-term this can make you feel better, long-term it will only hurt you and make things worse. My favorite stories are those of women I worked with after 10+ years of IBS frustration. They felt crappy, bloated, stressed, sad, frustrated….for more than 10 years. That’s the bad part of the story. The good part occurred when they finally did an elimination diet for real—Focused, documented, organized, assisted elimination diets—where they didn’t cheat, bargain themselves out of parts of it, or sabotage themselves. One of my clients lost 22 pounds in 4 weeks—most of it puffiness and inflammation, caused by ingestion of foods that had been irritating her system for more than 10 years. She subsequently lost 10 more pounds, and had her thyroid function normalize (not to mention she felt like a new person). Another client was saved from hormone replacement therapy after losing 10 pounds, cutting certain foods, and went into remission from Grave’s (thyroid) Disease. She had been seeing several specialists—for thyroid, hormones, and IBS—and medicating each one separately, but not treating her body as a whole unit. We discovered a link between gluten intolerance and her other thyroid/hormone diagnoses (which damaged her intestines over time, leaked into her blood stream, and as it closely resembles thyroid hormone, caused her immune system to attack that AND her thyroid). We cut the gluten, repaired the gut, replenished and revitalized the intestinal bacteria, learned stress management techniques….and she no longer sees a single specialist. On paper, it’s easy to quantify results. In conversation and stories, the really important part occurs when someone tells you how they feel. Even if you don’t have IBS, my personal and professional standpoint is that you should never stop exploring. My understanding of nutrition and health has evolved over the years, and it will continue to throughout my entire life. I’m open to it. 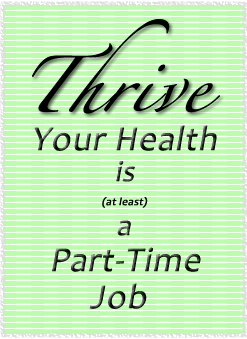 Your health might be my full-time job, but my health will always be at least a part-time job for me. I expect my clients to take a similar self-invested self-care approach. It’s hard work. But it’s worth it. What have you explored in regards to your health? It’s a wonderfully sunny Monday in NY. I’m basking in Starbucks right now, and looking forward to spending time outside later. Yesterday did not turn out to be as productive as I had planned, but it was an OK day anyway. Maybe it’s because of St. Patrick’s Day, but I’m feeling especially lucky right now. I am working at taking a view of things as not bad or good—just taking the “Be” approach… I make mental lists of things that I’d like to focus on: being honest, not judging people, working hard, playing hard… and really, right now, I’m trying not to rush through things that feel like “chores.” It’s easy for me to get caught up and think about how I have to clean the kitchen and I want to do it as quickly as possible so I can get done and do something that’s not such a “waste” of time… Instead of that, I’m trying to be more methodical about it, treating every task as a meditation. I was always horrible at meditating when I approached it as an “empty your thoughts” kind of task. Now, I just focus on breathing deeply and really seeing what is in front of me, noticing thoughts but not trying to change or analyze them, being so inside my body that I become hyperaware of it. I’m learning how to sit with thoughts and feelings—and that it’s possible to have opposite feelings at the same time. I can be happy and sad, busy and relaxed, all at once… but that’s a topic for another day. I hope your Monday is amazing. Loved this post Lisa. Just the encouragement I needed to continue to figure out what foods are hard for me to digest. I had way to much gluten this weekend, because i convinced myself that maybe I am not sensitive to it, needless to say I learned the hard way. I am supposed to have a blood test for food sensitivity, but I’m not sure if I will benefit more from paying attention to how my body feels after I eat something. Have you ever had any testing done? I had a few clients with “IBS” and I love all your info here. I truly enjoy reading your posts, always so informative!! I so believe in finding the foods that help you to thrive! Let food be thy medicine…. I really want people to feel “hope” about IBS, and not that the diagnosis is the end result. It can be a really long road! coconut oil on it! )…..but the arm bumps sound like it could be a side effect of an omega-3 deficiency (it’s a common thing). You could try a good quality fish oil supplement (or flax or other omega supplement) for a month and see what happens! Obviously, I’d suggest consulting your doctor, but fish oil and omega supps are pretty darn safe if you get a good one and stick to a recommended (on the bottle) dose! Great post Lisa! I am the same way — I keep trying new things to feel my best. And like you, the first 25 years of my life I really didn’t realize how miserable I was, I just put up with it! I love how you said your garbage is not my garbage — so true!!! For so long, I just wanted someone to tell me what to eat what was “healthy”, which obviously didn’t work for me. Sorry for the long comment, so much good information in this post! sugar and grains, oh sheesh, where do i start? I have struggled with IBS ever since my parasite back in 2009. It basically destroyed me. I think what’s helped so far is paying attention to sugars, even fructose, and stress. I have to get tested for crohns this month, but knowing you can heal with foods is comforting. Great post for ALL lisa! whoops, signed in as my husband, not me. haha. Wow, you always impress me when you talk about the different people you’ve helped with different issues. After I have the baby, I really want to get serious and figure out what foods bother me and how I can make my diet even better! Wow I absolutely love this post. I have IBS and it is so frustrating when I hear you can’t do anything about it. I have tried cutting out foods and then get annoyed and just add them back in. Reading this made me realize that yes finding a diagnosis is hard, but it’s worth it to stick it out in the end! Thanks for this!! I think you know my story about IBS. I Struggled for SO many years, but not with the typical IBS symptoms (no diarrhea or constipation, just bloating and gas). The low fodmaps diet has been a godsend for me. Currently I am working with a couple other clients who I plan on doing elimination diets with and then possibly having them try low fodmaps. I always hope it gives them as much success as it did with me! this blog post was a fascinating read, lisa! thanks for sharing the case studies – so interesting! i am totally of the mind that STRESS is a major factor in IBS-related issues. i’ve seen it in people close to me, and totally see the link between the two factors. i admire how you’re not afraid to try new approaches, keep experimenting – yes! and your last paragraph – i often find that cleaning, doing errands is a good time for “mindful meditation” – activity + thinking works better for me than sitting and “omming!” glad you went with the flow on the weekend and appreciated the activities you were doing. i love your posts I always feel like I am learning something and it also makes me reflect on my own actions, life etc. such a great way to take a 5 mins break and come back to the “NOW”. your Notes at the end are so honest and its great that you have got to know yourself and are able to live in the present. I used to have bowel problems, indigestion etc. I even started thinking I would have it for the rest of my life. Only when I started to explore and learn more about health, sports, food, all the processes in my body and when I started understanding my body and what was going on, I realized that I CAN be 100% healthy and that it was not normal to feel sluggish, have bad skin etc. There need to be more people like you to help others find their true self and help them to discover their bodies and regain their health. I should join you, can I come and train with you? Yes, please—come here, it could be like a yoga and food immersion! We’ll learn from each other! This probably comes asno surprise to you, but I adored this post! Thank you. Great post! I really feel that a lot of digestive problems could be eliminated if people gave an elimination diet a try. I know it’s helped me tons! I love the end of this post – I am very much looking forward to it being another topic for another day! Beautifully written . Previous post: Spring Came Early….